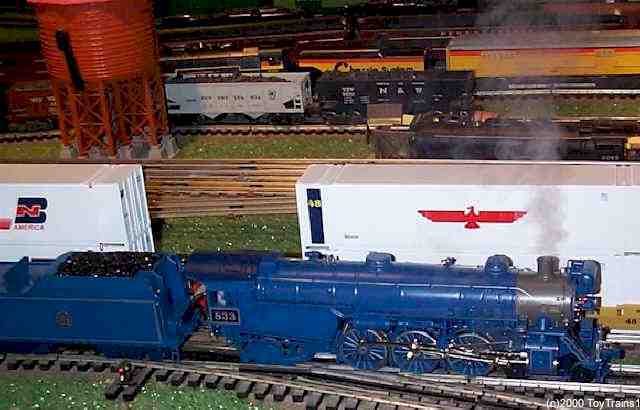 All of the text contained within this web site and all of the photographs and videos taken by ToyTrains1 are copyright (c) 2000 - 2015 by ToyTrains1, and may not be reproduced, in whole or in part, without the written consent of ToyTrains1. Very specifically, you do not have permission to "hotlink" or "direct link" my images or videos into your blog, web discussion board postings, or other web pages for any purpose. Don't do it! When you hotlink to my images, you're consuming the bandwidth for which I pay my web host. That constitutes "bandwidth theft," "bandwidth leeching", "bandwidth hijacking", or whatever you want to call it. To be blunt, it's theft and I take active measures to prevent such misuse of my content. Fair warning -- you'll wind up seeing the following image rather than the one you're trying to link to.